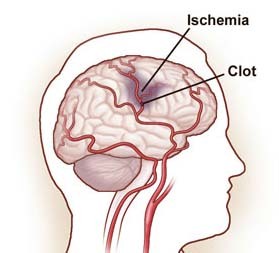 Thrombolytic therapy commonly is used to treat an ischemic stroke, which is another name for a clot in a blood vessel in your brain. 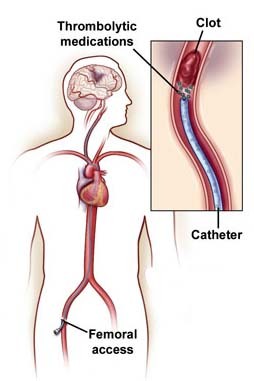 A bypass graft or dialysis catheter that has become blocked. You may be a candidate for thrombolytic therapy if you have symptoms of a stroke, heart attack, pulmonary embolism, DVT, or a clot in an artery or bypass graft in a limb. Pain, numbness or coldness in a limb. Diabetic retinopathy, a problem in the eyes that results from diabetes. Recombinant, or genetically engineered, t-PA (a newer version of t-PA) and TNK (Tenecteplase). Problems around your access site, such as bleeding, swelling, pain, or numbness. Complications are not unusual with thrombolytic therapy, which is why it should be carried out under close supervision.